It was 1966. Ronald Reagan was running for governor in California. I remember riding over to the Sears parking lot to see him speak on the back of a flatbed truck. They did things like that back then. I was 11-years-old and the 6th grade at Immanuel Lutheran Church, a private school. The school was having a book fair to raise money, which amounted to some books being scattered on tables in a classroom. That was the day I saw this book and asked my mom if we could buy it. She did. But somewhere I had been exposed to the comedy of Phyllis Diller. The self-deprecating housewife with frantic wig and gaudy house dress, who held a cigarette in one hand and told jokes about her husband, Fang, while letting out a loud guffaw. Now, here I was at the book fair, with a book written by her and a foreword by Bob Hope. How could I resist? I cherished that book filled with zesty one-liners. I read it, re-read it and studied it. I didn’t realize it at the time, but I was taking a course in how to write short jokes. Phyllis was a pro and, years later, I would find out that one of her writers was none other than Joan Rivers. I recall that book inspiring me to start collecting jokes. I cut them out of Reader’s Digest and started a scrapbook. When our family added a typewriter to our family room, I tapped away and saved jokes I had heard or created myself. A couple of years later, Phyllis Diller teamed up with Bob Hope again for a movie called “The Private Navy of Sergeant O’Farrell”. You bet I was there. 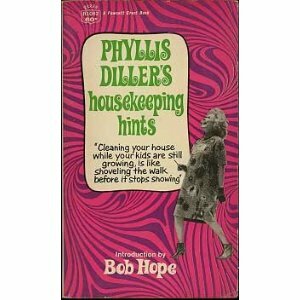 Funny that Phyllis, much like Bob Hope, lived such a long life. She passed away today at age 95, but not before making millions and millions of people on this earth enjoy a good laugh. I will forever credit and, perhaps, blame her for heading me down the road to writing comedy.